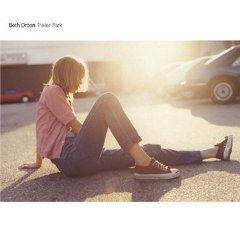 By merging swirling electronic textures with soft, acoustic folk on her 1996 sophomore set Trailer Park, Beth Orton ignited a movement in Britain, one that not only swept around the globe like a wildfire but also has rippled through the indie-folk scene ever since. In truth, Orton merely was extending the work of Portishead and Massive Attack. Yet, by presenting her songs in a more accessible fashion, she essentially established a template that allowed the singer/songwriter scene to remain relevant as well as to reach an up-and-coming generation of ecstatic rave-kids. Naturally, countless other artists immediately tried to copy Orton’s moves, but most of them haven’t come anywhere close to achieving the same level of magnificence — particularly across the entirety of a full-length affair. Where many of her followers wound up with albums that felt cold and calculated, the results of Orton’s efforts were mesmerizing and complex. Throughout Trailer Park, her melodies were abundant, though, at times, they would slip inside the haze of her hypnotic grooves, only to change shape and reappear. Wisely, Orton herself resisted the urge to turn her technique into formula. Instead, she shifted direction on her subsequent endeavors by alternating between peeling away and bolstering the various elements that she had combined in such a seamlessly elegant fashion on Trailer Park. Simplifying her approach, she swapped the set’s woozy atmospherics for a straightforward blend of folk and pop that borrowed more from Nick Drake than it did from John Martyn. Thirteen years later, however, Trailer Park remains her best album, and it still sounds like a revelation. Part of the reason that Trailer Park has been so durable is that the production styles employed by Victor Van Vugt and Andrew Weatherall were as triumphant as Orton’s carefully crafted lyrics. Placed inside the accompanying music, Orton’s words gain color and texture, and the moods shift and ooze like the waxy core of a lava lamp. Tangent, for example, is dark, ominous and foreboding, while Galaxy of Emptiness is steeped in isolation and yearning. Both tracks are expansive — 7-minutes and 10-minutes in length, respectively — but they never for a moment feel bloated. Orton’s songs cover the familiar ground of love that has been won and lost. In fact, poetic as they may be, once her impressionistic words are removed from the cinematic scope of the arrangements that Vugt and Weatherall helped to concoct, they lose some of their luster, and their flaws begin to creep toward the surface. Tracks like Someone’s Daughter and Whenever pale in comparison to the rest of the Trailer Park’s contents. Yet, at the same time, they also play an important role, refusing to let the endeavor’s electronic headiness slip into sterilized monotony. There is no doubt that Orton’s sparse, haunting cover of The Ronettes’ I Wish I Never Saw the Sunshine wouldn’t be quite so effective if it didn’t stand in such stark contrast to its surroundings. Instead of merely seeming like a sad, mournful dirge, Orton’s stark emotional outpouring hits home with crushing intensity. Throughout Trailer Park, jazzy bass lines and blues-y undercurrents anchor and warm Orton’s songs, and they dutifully bridge the gaps among her many stylistic juxtapositions. She might be plunging headfirst into the abyss of her own heart, searching for a connection on She Calls Your Name, and turning the tables on a former partner in Sugar Boy. Yet, her music keeps her centered and focused, not only giving her voice the room it needs to transcend the modern-day atmospherics but also providing her with the opportunity to explore the beauty that adjoins the disparate worlds in which she lives. Capitalizing upon the success of Trailer Park, Orton issued Best Bit, a four-song EP, the following year. Combined with a slew of B-sides, the endeavor forms the basis for the latter half of Trailer Park’s incarnation as a commemorative collection. There’s nothing among the extra tracks that Orton hadn’t already brought to fruition, but taken in full, the material further outlines how refined her craft already had become. As solo selections such as Safety and It’s Not the Spotlight prove, she already had developed a presence that was commanding and confident. At times, though, she sounded so much like Natalie Merchant that it might have been challenging for her to distinguish herself without the accompanying electronic flourishes that dotted Trailer Park’s terrain. Orton has yet to find another producer who is as capable of framing her work as the pairing of Vugt and Weatherall. Nevertheless, with each subsequent album she has issued, Orton has made improvements to her writing style, leaving no doubt that somewhere down the road she will conjure another batch of songs that are as cohesive and captivating as those on Trailer Park. Trailer Park: Legacy Edition is available from Barnes & Noble.